Moms are extremely giving, so why not give back? Don’t know what to get mom for Mother’s Day? Don’t worry, we’ve got you covered. And moms, don’t just sit back. You care for other’s all year round, it’s time to treat yourself. We’re offering all the wonderful moms out there a special that will have you smiling from ear to ear! 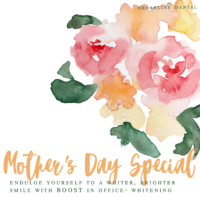 Get pampered with BOOST In-Office Teeth Whitening to add some shine to your smile. 2. Like AND share our Facebook page on your Facebook profile to spread the love with all your friends and family! What is BOOST In-Office Whitening? BOOST In-Office Whitening uses a combination of 40% hydrogen perioxide gel and activator to produce maximum whitening results in the shortest time possible. Regularly priced at $500, mom’s you will receive this offer at the special discounted price of $350! *Offer must be scheduled by June 15th, 2017. Some restrictions may apply. Call us for more details. If you’re seeing this and have any questions or you are a new patient and is interested, give us a call at 206.440.0065 for more details on how to get started!